Was his sermon *that* bad? I have to admit that I was tempted just to post, "No, He told me it was just an accident. " [The preacher] just kept asking God what else he needed to say. Yet another reminder that I should keep my sermons short. The odd part is when they evacuated because of fire. Not that it doesn't happen, but whenever lightning used to hit our farm (and yeah, it would stun us for a couple minutes,) we'd go out to make sure nothing else was burning. Even if coincidence, it's still scary enough to remember why we call those things, "acts of God," no? I'm strangely amused that it took them 20 minutes afterward to realize the building was on fire. Heh. I saw that one too. (it's a devout Christian site, but they have the facts essentially correct). So maybe God does look after his own. They should have guessed when they saw Satan sneaking up on the church. I mean, okay, he was hiding behind the clouds, but c'mon, giant white-hot horns of flame? It wasn't a unicorn! Edited by Orpheus, 06 July 2003 - 10:27 PM. Agreed - that was hilarious !! Well, he did ask for a sign, personally I think Yield, would've be enough. I love this story! 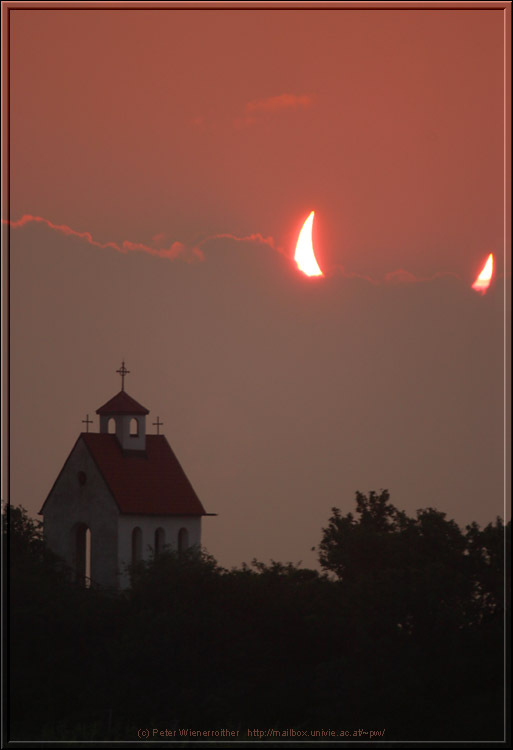 Also, the "demon horns" pic posted by Orpheus. Maybe the sign he got was a STOP sign? You think THAT was shocking, Shaun? Having your church struck by lightning during a sermon is nothing! Try having lightning strike your tongue stud while you're on vacation. but the poor girl has suffered enough. Was this perhaps God's way of telling him to pipe down? Good thing they weren't at the river doing baptism. !!! Well! Now I KNOW I'll never get a tongue stud... LOL! As a follow-up (in the interests of accuracy) to my last link about the woman who had her tongue stud struck by lightning, I should note that the same young lady is also pictured in another BBC story, where she is described as a "28-year-old woman who had to undergo emergency surgery to have a piercing removed" in an article entitled "Tongue piercing warning"
The weird thing is that the "warning" article was dated May 23, and shows her with a single tongue stud. The lightning article was dated July 5, and shows her with two. "I appreciate a nice pair of earrings, but tongue studs are the only piercing I *understand*"
Edited by Orpheus, 08 July 2003 - 08:36 AM.